We left early to take advantage of the light winds. It seemed like an hour we spent passing the huge naval harbor. A patrol boat followed us the entire way. There was every kind of naval vessel you can imagine including several aircraft carriers. There is a large building behind every dock which we guess is a barracks and warehouse. Then it is out into the mouth of the Chesapeake Bay. We passed two ancient lighthouses as we headed north. 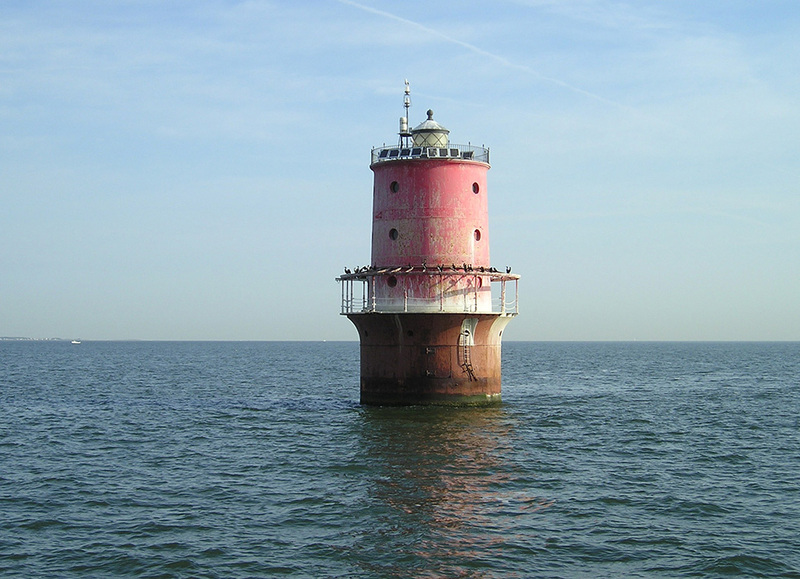 (see photo of Wolf Trap Light). Arriving at Deltaville we were greeted by boaters from Eddyville Creek that we first met last fall at Aqua on the Tombigbee. A visiting Yacht Club was having a blessing of the fleet ceremony. The crews were all dressed up in their best nautical outfits. The courtesy car was a Buick Roadmaster station wagon. Certainly the finest courtesy car yet. Most are wrecks.